In reality, it's not flying low, neither fast, and that small target most likely isn't something that most of us would call an aircraft or a vehicle. All of that will be shown in this post. What's even more significant is that all those claims were already shown to be false on the day that video was released, both by yours truly (elsewhere) and various other people. The video itself provides sufficient instrument data, which when combined with simple trigonometry, shows unequivocally that the claims of low altitude are just plain wrong. In reality that target is flying closer to the altitude of that plane than the ocean. That alone was basically the end of that video as a credible UFO case. It all hinged on the assumption of low altitude and hence the apparent high speed, which really was the only "extraordinary" feature it had, but due to the real altitude, most of that apparent speed is just caused by the parallax effect and reflects just the speed of that plane. Even though the real speed of that target can be shown to be relatively slow with reasonably simple math, calculation of the actual flight path of that jet and target is a much more complex operation. I did a detailed spreadsheet calculation for that, which I initially published elsewhere on March 13, so 4 days after the video was released. The results were in good accord with simpler calculations and showed that the actual speed of that target is just 77km/h=48mph (+-unknown effects by the winds in terms of the actual ground speed). Similarly simple calculations and measurements of the size of that blob on the video show that the size of that target is in the range of 1-2 meters. So everything the video actually shows fits to a large bird or similarly sized balloon. That smallish target does absolutely nothing interesting, it just flies relatively slowly more or less in a straight line at high altitude, and nothing else happens. And that was supposed to be evidence of what? After those had been revealed, by several people with independent calculations, and especially after I got to know that at least TTSA advisor Garry Nolan was aware of it and admitted their claims regarding that altitude were wrong, I expected TTSA to admit their mistakes. Even though I was well aware of their earlier party balloon fiasco, which they apparently still don't want to fully admit. But here we are, some 40 days later, and the TTSA Go Fast page still makes all the same false claims, and apparently many still buy them, some even their stock, so I'm re-releasing the results of my earlier calculations here with some additional details. Before we get going, there seems to be one common argument that needs to be dealt with. Luis Elizondo has been repeating shallow blanket statements about trained pilots with million dollar equipment and so on, who supposedly should be able to spot the difference between mundane things and something extraordinary. That's basically a variant of the appeal to authority fallacy, and goes very much against the principles of another common argument Elizondo makes, that we shouldn't trust him but the evidence. Then when the problems of the evidence are revealed, he tends to counter by repeating that fallacy. It should also be pointed out that Elizondo has a tendency to group together various supposedly extraordinary features from multiple videos, like extreme speeds, strange appearance, lack of visible propulsion and so on, and use that combination as if it as a whole would apply to all those videos, as if all of them would show the same Nimitz Tic Tac in action, or something. That simply is not true. The Go Fast video in particular shows none of that. It's definitely not the Nimitz Tic Tac, if someone thinks so, as it's way smaller for starters. As for the training and equipment, remember that the pilots actually saw pretty much the same you can see in that video. A small unclear blob from great distance. That's it. The resolution of that ATFLIR pod and their display is basically the same you can see on the video, and that's according to the manufacturer and their specs sheets. And for them it happened in real-time. They had a couple of seconds to try to identify what those few pixels showed on their screen, in a moving plane, while doing other stuff. For most of us it takes longer to find a calculator, let alone perform the math that needs to be done to figure it out. Also note that, at least in that video, neither pilot actually claims it would be something extraordinary, let alone alien. They just seem to have good time, probably practicing to use their target tracking equipment, and there's no indication it would have been anything but a random target that just happened to be there. Maybe they did later report that they believed it was flying fast and low, in which case they made the same mistake. If they didn't, it's only the TTSA that made such claims, and made it sound as if the pilots did too. I'm actually suspecting the video ended up being presented as a "UFO video" because it was stored along with some pilot comments that contained keywords about some unidentified target, and the AATIP guys were searching those from various databases, found that, and the rest is rather sad history. As was said before, the true altitude of that target already breaks the case. It can be calculated trivially from the instrument values shown in the video, and there's no ambiguity there, TTSA agrees on how they should be interpreted. Apparently none of them just performed the simple calculations to see what they actually reveal. More importantly, if their conclusions match those by the AATIP, neither did they. Since that would have been pretty much the most elementary and obvious thing to check, and would have taken just minutes, it would basically mean nobody did any sort of serious investigation for that video at any point. It was cleared for release in August. So the TTSA sat on that video for months, and apparently none of them performed that simple mathematical check during all that time. The math is really simple trigonometry. The vertical distance between the plane and the target can be calculated from: (distance to object)*sin (vertical angle to object). Subtract that from the altitude of the plane, and you get the altitude of the object. With those initial values, the exact altitude values are 4048m for red, 4062m for green, so they are very close to each other, indicating the altitude of that object remained pretty much the same during the video. Results are similar for every step of that video. Small variance in numbers is caused by the inaccuracy of the displayed instrument values and the large distance to the object. I believe the best estimate for the exact altitude is around 4039m, based on altitude calculations for the whole video and how it fits to other instrument values. In any case, it's very close to that just above 4km mark, there's no question about it. The above image in it's original size has correct distances and angles, so you can measure this stuff from the picture if you like (1 pixel=10 meters in the original image). But here's one more fun fact. It's not even necessary to calculate anything with those angles to see that the TTSA statement of low altitude is just wrong. Since the rangefinder is showing the object is 3.3 nautical miles from the plane at the very end of the video, that is 20051 feet, and the plane is flying at 25000 feet, it's pretty darn obvious that the target is not "very low over the water" as TTSA claims. It couldn't be, even if they were looking straight down, and they didn't. That's all it would have taken for them to realize their claims are not true, just converting those values to a common unit and comparing them. Apparently none of them ever did. The curvature on the path of the jet was calculated from the banking angles as revealed by the attitude indicator/artificial horizon on the video, as measured manually from the video once per second. Those were converted to turn angles by standard formulas and their applicability for the F/A-18 was verified from NATOPS F/A-18E/F Flight manuals and the turn rate charts contained therein. That was the only visual measurement those calculations use, otherwise they just use the instrument values. So they are in no way dependent on visual analysis of video content. The curvature on the path of the target is most likely caused by the limited precision of the displayed instrument values and it likely had a more straight line trajectory than the picture shows. More about that later. The grid in that picture is in meters, so it covers an area of 7x7 kilometers. The green lines and angles show the rangefinder distances and horizontal viewing angles for the ATFLIR pod at the beginning and end of that tracking period. 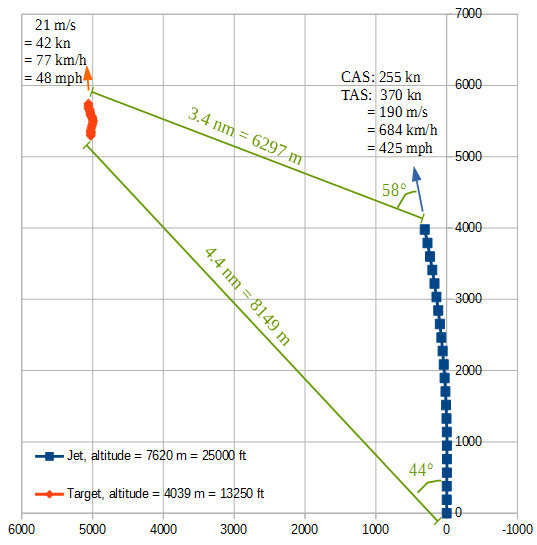 Note that those distances are total distances between the plane and the target, but since they were at different altitudes, the horizontal component of that distance is somewhat shorter, and that is why the green lines look shorter in that 2D picture, which shows the situation from above. Simply put, that target was almost 10 times slower than the jet, and most of the apparent speed was caused by the parallax effect of a high flying target seen against the far away background. And once again, there's no disagreement how the various instrument values should be interpreted. It's all according to how TTSA as well as more reliable sources describe them. It's just a matter of actually using that information and looking what it really tells. The size of that target can be calculated independently from any of the other calculations above, they do not depend on each other. Again, the calculation is relatively simple. We know the distance to the target thanks to the rangefinder figures, and we can get the field of view (FOV) of the ATFLIR from the specifications given by the manufacturer, as well as various other sources. The FOV is 0.7° for the NAR(ROW) mode with 1.0 zoom, which are shown in the video. So we just need to choose a point of the video and first calculate how much area the entire view covers from the distance indicated by the rangefinder, and how many pixels the object takes relative to the entire view. The point we choose is when the timestamp at the bottom shows 4246A and the ATFLIR is just switched between the WHT and BLK modes, so that we can easily try to estimate the size of the object from both modes from almost consecutive frames. 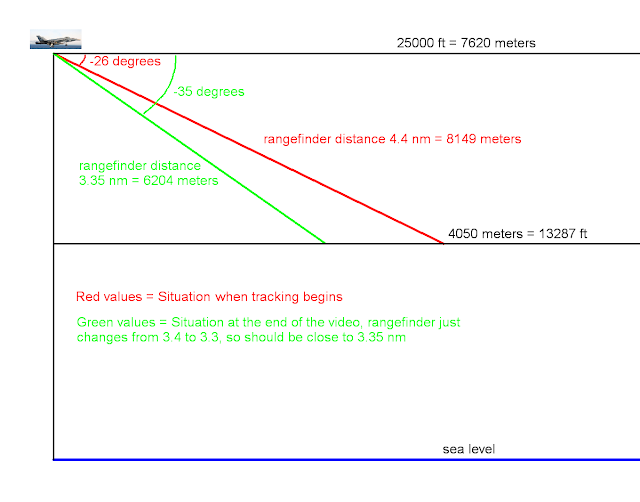 At that time, the rangefinder indicates a distance to the target of 3.7 nautical miles, and it is not close to changing to other values in either direction on the video, so it should be relatively close to 3.700 nautical miles, assuming normal rounding rules, so the calculation should be precise enough. I'm using the version of the video that was embedded to the Washington Post article, as it seems to have less compression artifacts than the YouTube one that is embedded on the TTSA page. 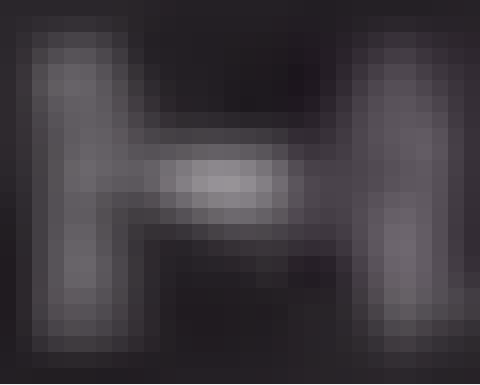 The original video width is 640 pixels, same as the resolution of that ATFLIR sensor (which is 640x480). The height dimension is more suspect due to some indications of aspect ratio changes, but since the target is longest in the horizontal direction anyway, that's what we are most interested, the largest size it shows. So the jet/camera is on the left, looking along the green line. The picture shows what that view looks like from somewhere high above the plane. The red line shows the width of the entire visible area in that video from the distance of that object. That calculation basically just calculated the short side of that top triangle, which has half the FOV angle and hence presents half of the width of the screen, that is the reason for multiplying and dividing by two (although in practice that multiplication and division could be skipped as the result is pretty much the same). So the width of the entire visible video frame is 640 pixels and 83.7 meters from that distance, and we just need to measure the width of the target in pixels to find out what portion of that it takes. Perhaps somewhat surprisingly, measuring those pixels is pretty much the hardest part of that calculation, as the blob is so small and the edges are soft. So should we measure only the brightest parts, or to some distance of the fuzzy edges? And how could we even do that properly, as part of those edges is hidden behind those target indicator bars? Video compression tends to soften edges. Those target indicator bars for example most probably weren't that soft on the original screen. ATFLIR may perform image processing, that can also for example soften edges or enhance contrast. There are no doubt all sorts of vibrations and movements, both on the plane and the target, which despite all the image stabilization that is done are greatly multiplied from those viewing distances. The refresh interval for that camera is 50 or 60 frames per second, meaning if the target is for example a bird that flaps, it most likely captures some movement for each frame, again softening and extending edges. The target looks somewhat bigger in the BLK mode, probably due to some of the above factors, which just adds to the uncertainty on how it should be measured. The object is viewed from a certain angle, so the apparent maximum length doesn't necessarily represent the real longest axis. At least most of these reasons indicate measurements from the soft edges would likely be wrong, and the correct answer is more likely to be closer to the higher contrast areas only. The entire original width of those closeups is 30 pixels, and it's clear that the object takes at most 20 of those, even if measurements were extended to very soft edges, and sizes at or below 15 pixels seem more realistic, 10 being closer to the edges of the higher contrast parts. So the size of that target is less than 2 meters for the more realistic estimates, and probably closer to a meter than two. In summary, everything in the video is consistent with a large bird, and so seems to be the timing in the middle of the best birding season. Ufologist Bruce Maccabee has also tried to calculate the altitude, speed and size of the Go Fast object, with differing results. Since many seem to believe he is up to the task and his results can be trusted, I probably should point out why it's not really so. Maccabee began his "tentative calculations" by trying to calculate the altitude. He strangely began by converting the highly precise altitude of the plane to nautical miles with just two digits, losing a lot of precision for nothing, which seems to be a common feature throughout his calculations. Then he took the rangefinder distance and vertical angle values from a fake screenshot TTSA made for explaining the displayed values. Such combination of values doesn't actually exist in that video, which is why the result is pretty much meaningless. Then he failed to calculate the result of simple subtraction of 4.1 – 1.54. After that he did one more unnecessary rounding and got a resulting altitude of 1.6 nautical miles, so 9722 feet, which is off by around 27%. Not that it matters too much, since he doesn't even utilize that key information in calculating the object speed, but instead tries to guesstimate it by eyeballing how the moving target travels across the screen against a moving background as filmed from a moving plane. It's hardly a surprise that his results are also all over the place. Initially he estimated his crossing time as 3-4, and later corrected it to 1.8 seconds, which according to him resulted in "twice the larger speed previously calculated". That's how accurate his calculations are. But it gets worse. Oddly, instead of using rangefinder values the video actually shows, he actually guessed his own! Really, he tried to do his calculations from those frames that do not have sufficient information, instead of using those that do. Not that even that matters too much, as he isn't even calculating the right thing. He is basically just calculating the apparent speed, not taking into account the effects of that altitude he just calculated (incorrectly), and then tries to simply subtract the speed of the jet from that. It just does not work like that. So what was his resulting speed? Initially he calculated that the "differential speed" between the plane and the object is about 150 knots, which he subtracted from the (incorrect) speed of 250 knots for the plane, getting a resulting speed of 250-150=100 knots for the object, going towards the same direction as the plane. But then he made his correction, and as far as I can see from that confusing medley of errors, got a new "differential speed" of 330 knots. Which means, if he had then subtracted that from the speed of the plane, as he did before, his result would have been 250-330 = -80 knots. Meaning the object was actually going slower and to opposite direction. But he didn't and instead claimed the speed was "twice the larger". I'm not sure even he knew what he was calculating at that point. Additionally he is using an incorrect FOV value of 1.5° and CAS airspeed instead of TAS (true airspeed) as he should have, which introduce large additional errors to his results. It's just errors on top of errors. His estimate on the object size is similarly erroneous due to that wrong FOV value and his imprecise numbers. But here's a fun final twist to the story: If he had actually correctly used the TAS speed for the plane, which is 370 knots, and performed that subtraction in the same way he did before, his result would have been 370-330=40 knots, towards the same direction as that plane. That's pretty much exactly the same as what I got! Even though that would have really been more like a lucky guess than a result from a meaningful calculation. I'm very pleased to discover this great site. I wanted to thank you for ones time for this fantastic read! !